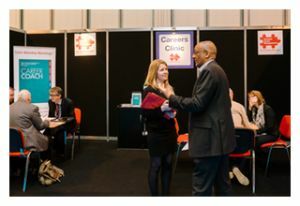 The UK’s leading franchise exhibition, The National Franchise Exhibition, is set to return to Birmingham’s NEC, on 16 & 17 February and we’ll be on hand to provide career advice from our expert career coaches. We will be running the Career Advice Clinic providing free one-to-one consultations so visitors can talk through their career options with our expert career coaches. They will be able to offer strategic insights, guidance and career planning advice. Find out how you can formulate an action plan, avoid the pitfalls of franchising and identify opportunities that match your skill set. Reserve your place to speak to a professional careers coach and book FREE tickets using code PCM1. Book your career coaching session here. Join us at the exhibition and explore the various sectors and business opportunities this lucrative industry has to offer. Meet with leading brands, listen to a comprehensive seminar programme covering the fundamentals of franchising and receive free guidance from a host of professional advisers. The exhibition is the only event of its kind that is exclusively supported by the industry’s sole regulatory body, the British Franchise Association (bfa). This means that you can browse the catalogue of brands knowing that each exhibitor has proven they operate a viable business format. No other exhibition can offer this assurance.